OSHKOSH, WI EAA AIRVENTURE, JULY 29-AUGUST 4, 2013 – SIMCOM has completed the first initial training course for the new Total Eclipse using its recently qualified state-of-the-art level D full flight simulator equipped with new IFMS avionics. The course is comprised of six days of ground school, fourteen hours of brief/debrief time, and eighteen hours of simulator training. All systems and phases of flight are covered during initial training. Customers develop a thorough understanding of the IFMS avionics system allowing them to use it to its fullest potential in both normal and emergency situations. SimCom Training Centers offer professional pilots and owner/pilots realistic simulator-based training for a number of jet, turboprop and piston powered airplanes. SIMCOM currently operates 56 simulators in four locations – Orlando, Florida; Scottsdale, Arizona and Humberside, United Kingdom. Courses are available for initial, recurrent and refresher training. For further information, contact SIMCOM at 1.800.272.0211, or visit them on the web at www.simulator.com. NOTE: A high resolution photo can be downloaded from the website at www.simulator.com. Click on the ABOUT SIMCOM tab at the top of the page. Scroll down and click on PRESS CENTER. Click on PHOTO GALLERY. The Eclipse simulator the far right photo in the final row. 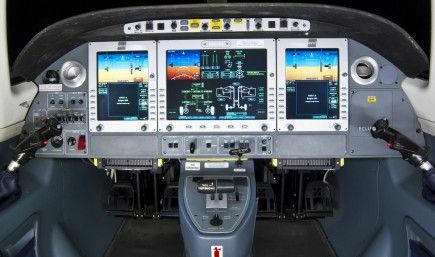 It is titled: Eclipse 500 Level D Cockpit. If this picture is used, please add a photo credit to read: Photo by Ron Csuy, Director of Sales, SIMCOM Aviation Training.